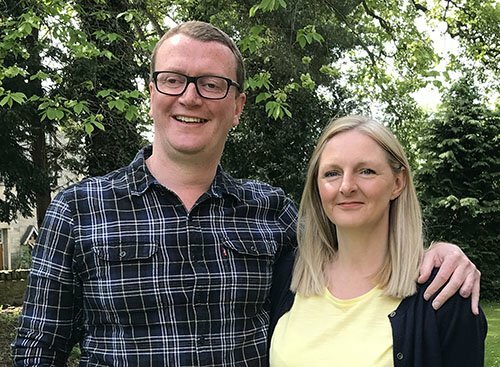 My husband (Stewart) and I are the people behind My Clean Home Guide. We have put together this resource to help you find the best home cleaning & laundry products, as well as providing useful hints & tips. An ironing board is an essential household item unless you choose to dry clean everything. A great ironing board will last years, maybe even decades. However, an ironing board cover won’t last that long. Typically, a cover will need to be replaced every few years depending on how much you iron. Choosing the right ironing board cover will help you be more efficient at ironing and will be durable to last a bit longer than most do. It also should be the best product for the money and still meet all of your needs. 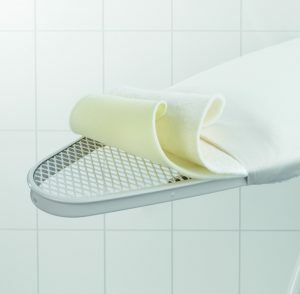 This ironing board cover by Brabantia is great for both steam generator irons and normal irons. It has a heat reflective surface that aids in quick ironing. Also, this ironing board cord fastens with a stretch system and a cord really easily. 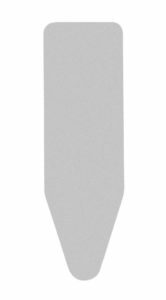 The Brabantia Silver ironing board cover comes in a Size B which will fit a board the size of 124cm x 38 cm. If you are looking for where to buy this affordable and durable iron cover check out Amazon. You won’t be disappointed. This Smart Fit Reflector Board Cover by Minky has a nice geometric design on it that doubles as heat reflective for faster ironing. It has a standard one size fits all due to its super elastic fastening system and claims to fit up to 125cm x 45cm. However, it won’t fit the extra long sizes such as Size D or E which are 135cm long. It has a thick felt backing to prevent slippage and give you a smooth ironing service. This ironing board cover is also quite durable and washable. 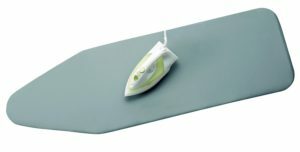 This can be considered the best buy in ironing board covers due to its affordable price and great features. 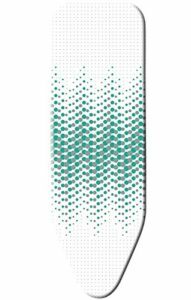 This stylish ironing board cover by Brabantia is made from durable cotton and has a resilient foam layer for comfort and smooth ironing. It also includes a safe zone to park your iron temporarily while you iron. This ironing board cover fits Size D boards, as well as some size E boards. The cover dimensions are 135cm x 45cm. It’s easy fastening cord and stretch system allows you to take the cover on or off with ease for washing. Overall this is not a cheap quality ironing board cover. It’s quite affordable and does an amazing job. This pretty floral pattern ironing board cover by Saphare is made with 100% cotton and enriched with Teflon and Aluminum for great quality and durability. It features an integrated foam pad for comfort and better ironing overall. It also is heat resistance. This floral iron cover is adjustable and one size fits all due to its drawstring and toggle fastening system. It fits lengths from 115 cm to 134 cm and widths from 30cm to 49cm. Overall this ironing board cover gives you flexibility in size and is great of great quality. If you are looking for a cover to meet your needs, this ironing board cover from Saphare is just that. 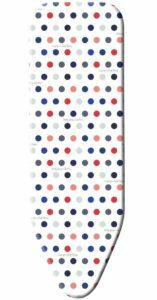 This adorable polka-dotted ironing board cover by Minky is not only fashionable but also quite durable. It features foam backing for a very smooth and comfortable ironing. It also has a durable felt backing to prevent slippage. This is an extra wide and extra long ironing board cover that fits up to 135cm x 55 cm. This is adjustable for most Size D and E ironing boards. We cannot think of a better board cover for those extra long ironing boards. This is truly a great ironing board cover for the price. You may not think a lot goes into choosing an ironing board cover other than price and designs. However, there are several features that you should consider before purchasing a best selling iron cover. Easy To Put on: The majority of ironing board covers are easy to put on. They either come with elastic or a drawstring or a combination of elastic and drawstring. Keep in mind drawstrings will work with various widths but must be the right length for the board. Foam Layer: A foam layer in an ironing board cover serves two purposes. First, it helps you to iron smoothly. Secondly, it is to aid you in comfort while you are ironing. Any good ironing board will have a durable foam layer. Felt Backing: The purpose of a felt backing on the cover is to make sure the cover doesn’t move or slide around while you are ironing. A cover should hold firm in place while ironing, to prevent further wrinkles or other problems. Thermal Resistance: Thermal resistance keeps heat where it’s supposed to be while aiding in a quick way to iron. The purpose of thermal resistance is to keep hot things hot and cold things cold. This makes perfect sense when you are ironing. Reflective Surface: An ironing board cover that has a reflective surface is an easy and fast way to get your clothes ironed without losing your standards of ironing. A reflective surface transfers its heat back into the clothes that you are ironing, making the whole process much quicker. Durability: Most covers are made of durable cotton as well as other materials. Be sure to buy the best, most durable cover for the best price. You will be happy if you choose a good quality ironing board cover. Washability: For ease of use and to maintain your cover for years to come, be sure it says that it is washable. A washable cover will be easy to take cover and maintain. Dyson vs Shark cordless vacuums – Which one do I choose? Vax Pressure Washer Reviews: Which one to buy?